Trevor with Washington Shotblasting spoke with us a few weeks ago about creating a website. They sent in a check to get started with their website, web hosting, and a domain name. Once the check was received, we got the domain name and web hosting setup and started on the basic website setup. After obtaining details from Trevor for what he wanted on the site, we got all of the work done in less than one week. He requested a couple of changes – such as the background graphic, removal of some photos, and changing of the top header area of the website, but those were also completed very quickly. Trevor also had us setup a contact form on the website in addition to a photo gallery where they can easily post photos in the future. Thank you to Trevor and Washington Shotblasting for their business! 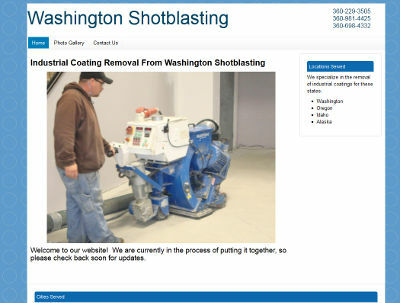 The Washington Shotblasting website is at washotblasting.com.